The England Test captain, Andrew Strauss, hit a career-best score and Sam Robson a century to put Middlesex in a formidable position after the first day of their County Championship Division Two match against the newly crowned T20 champions, Leicestershire, at Lord’s. After being put in to bat, Middlesex closed on 370 for one, with Strauss on 184 off 254 balls with 19 fours and two sixes. Robson made 101 before retiring hurt and Jamie Dalrymple added a brisk 46 before becoming the only wicket of the day. 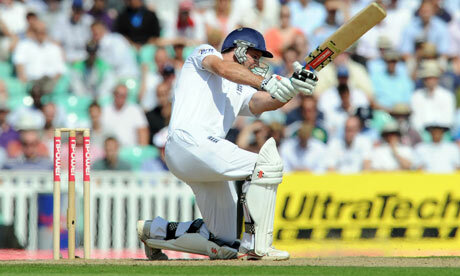 The first runs came in the fifth over when Strauss pulled Matthew Hoggard for four. Two overs later he collected three boundaries in four balls. Robson came out of his shell when he cover-drove Nathan Buck for four in the 12th over. Four overs later the 22-year-old flicked Rob Taylor to the rope at square-leg before threading the next delivery through point for four. The 24th over saw Strauss bring up his fifty, off 67 balls, with a cut for four off Taylor. Just before lunch Robson also moved to his half-century, in 96 deliveries, by dispatching Buck to the point boundary before Scott Newman and John Simpson were presented with their Middlesex caps during the break. As if to underline Leicestershire’s plight, the first semblance of a false shot came as late as the 44th over, when Robson bottom-edged a four off Taylor. Three overs later he moved to 90 courtesy of a mistake by Hoggard at mid-off. With Strauss and Robson matching each other almost run for run, Strauss went to 99 when he took Middlesex past the 200 mark with a four through backward point. Two overs later the England captain brought up his 42nd first-class hundred in 145 deliveries with his 15th four – which Wayne White, at point, parried to the boundary. In the 53rd over Robson joined Strauss on three figures when he drove his 169th ball, from Jigar Naik, through cover for four. Shortly afterwards Robson lost sight of a short-pitched delivery from White and was forced to retire hurt on 101. Nevertheless his alliance with Strauss, worth 231 in 56 overs, had set a record opening stand for Middlesex against Leicestershire. Dalrymple announced himself by cutting and pulling the second and third balls he received for four and at tea Middlesex were 271 for no wicket. In the third over after tea Strauss lifted Naik over long-on for six. Five overs later he brought up his 150 in 202 deliveries, though not before he had swept Naik for another six. Leicestershire’s only success of the day came when Dalrymple, cutting, fell to the part-time leg-spin of Josh Cobb, giving the wicket-keeper Ned Eckersley his first scalp in first-class cricket. Dawid Malan joined Strauss and closed on 19 not out.